It’s another exciting night of American Idol on FOX with an all new Thursday January 15, season 14 episode 4 called “Auditions #4” and we have your weekly recap below. On tonight’s episode, auditions are held in New York City. Adam Lambert serves as a judge. On the last episode, everyone’s favorite singing competition continued with auditions to find those who had what it takes to become the next American Idol. Did you watch the season 14 episode 3? If you missed it, we have a full and detailed recap right here for you. Tonight’s show is going to be an exciting one, which I’m not going to miss and neither should you. Tune in tonight at 8 PM EST! Celeb Dirty Laundry is your go to place for all the up-to-date American Idol News and we’ll be recapping it right here for you. Do you have a favorite so far? Hit up the comments and let us know who you really like! Young hopefuls from all across the country have come together to audition for the 15th season of American Idol. Yet like we’ve seen before – some of them should have really just stay home! 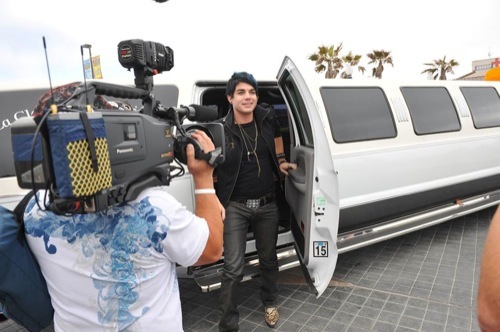 On tonight’s all new episode of Idol, we’re introduced to an old face, Adam Lambert is returning as a guest judge in place of Keith Urban. And while Adam can be a tad out there – having someone around that’s been in the contestants’ shoes has put some them at ease. They simply assume he’s going to be easier on them so let’s hope they’re right. The first audition of the night was Sal. And he came to the competition in a suit ready to pay homage to Sinatra. But before he got the chance to sing, the judges had a little fun at his expense. Henry bet Sal a hundred dollars if he was able to correctly identify a Sinatra song and after he won it – Henry tried doing a second question. Yet, like any other good New Yorker, Sal knew when to cut ties and keep the money. So he sang and sadly for him only two judges liked him. Henry, Sal once good friend, ended up voting against him when it counted. Though, Henry was then out voted by the two other judges who chose to see Sal had potential. Henry however wasn’t always the lone wolf. He did go on to agree with Adam and Jen about another young man. And that time a stuffed bear was involved. J. None actually bought a stuffed bear to his auditions. He said he got it when he was small and had to go into the hospital because of his asthma. And now it’s his lucky charm. The judges loved the bear and also the story behind it but Henry often forgot to stop playing with it. He still listened to J. None long enough to vote yes but he kept bothering his fellow judges with his bear impressions. And then there was Jax. She was 18 and yet she sang like an angel. Her voice was called unique and there wasn’t anyone who didn’t love it. Jax had started singing in order to help her dad who had been a firefighter first responder during 9/11. And by the end of her audition the judges could see why. But with every Jax there comes a Johnny. Jonny was a character. He made the judges laugh and he seemed like a nice guy. Though he turned out to be really intense and not in the good way. When he sang, he would get this look in his eye that could be called semi-frightening. Johnny got a “no” and thankfully that didn’t appear to faze him in the slightest. He just returned to his old life of street performing. Najah on the other hand was a street performer that did get a ticket to Hollywood. Even before Najah started singing down in the subways, she came from a musical family. So being an artist came natural to her. She was able to captivate her artist without any using any tricks. She merely stood still and sang while playing her guitar. So she got a lot of cred with the judges for that. After she left, they called her a serious contender. There were others who didn’t get as much of the spotlight per say. But there was also guys who got the spot light simply for the fact they were hoping they could throw themselves at Jennifer Lopez (not in a scary way) as soon as they finished singing. Both Tion and James apparently loved her and offers were made but were sadly turned down by the famous actress/singer. Though she still took the rose Tion had given her. Later on, the judges heard Shi sing and their verdict can be a bit surprising. For you see, Shi did know how to sing yet she didn’t know how to add her own emotional connection to the song. The judges each told her they felt like she was mimicking Amy Winehouse yet in the end they chose to give her a ticket to Hollywood. Adam was outvoted by Henry and Jen on Shi though even after she got her ticket – he still didn’t think much of her. Adam, the guy the contestants thought was going to be the easiest on them, was eventually proven to the hardest one to please. He didn’t pull his punches at all and in fact he reminded a certain someone of the old days with Simon. Nevertheless, there was one person at least that was able to convince Adam to change his mind and that Eric. Eric had sung a Queen song and while it wasn’t perfect – he talked the judges into seeing his potential. And now Eric is going to Hollywood! The second half of tonight’s episode was defined by blonde ambition. There was Maddie, Courtney, and Jackie. All blonde and they each chose a color that would look great on camera. First up was Maddie who had originally auditioned last year but unfortunately did not get in. So her second time there was her chance to redeem herself. And she was able to do that. Maddie succeeded in getting a ticket to Hollywood but if this fails again – will there be a third time? As for Courtney, the judges loved her confidence. Adam said it made him see how she was going to be sticking out the contest till the very end. Plus it didn’t hurt that Courtney wasn’t fazed in the slightest when a cockroach across the stage. And lastly there was the baby. Jackie was 17 and from a small town. One she wanted to leave so she auditioned for Idol but as it turns out she lacked a certain amount of soul. So the judges asked her to work on it in Hollywood. Jackie was screaming so much with excitement she could actually be heard during the next contestant’s interview. Qaasim was a Brooklyn native who came from a performing family. And while he was talented – he won over the judges mostly due to his personality. Qaasim ended up being another character and by the end of performance (not just of him singing) the judges couldn’t wait to give him his ticket to Hollywood! Though not everyone in the contest was going to get a ticket. And Bridgette later learned that for herself. She was also someone that had talent but unlike others she didn’t know how to channel it and that left her performance lacking. So Bridgette didn’t get a ticket meanwhile a cartoonist also named Adam drew caricatures of the judges and needed a moment to control his voice but still got his free ride to where dreams come true. Katherine was another talented singer. And she did get her ticket but after her performance they appeared to be a long line of “no’s” right behind her. So much so the producers didn’t even bother covering their performances. Then, seemingly out of nowhere, Travis came and he had the judges rooting for him before he had started his song. You see Travis was supposed to go to Berkley to study music and at the last minute the funding fell through. Yet Travis remains an upbeat young man – he still has hope. And so the judges didn’t want to be the ones to burst his bubble. And, luckily, they didn’t have to because once he started singing – the judges could see for themselves how talented he was. Benjamin, though, was a no go. The judges were laughing at him not with him. And that’s all because he tried to pull off a gimmick. Many other people tried to the same and guess what – none of them were taken seriously! There’s difference in getting the judges to remember you and making the judges want to forget you! Next up was Yanni and she came to the auditions with her boyfriend. They hadn’t auditioned together but they were in the room together in order to lend each other their support. So sadly Nick had to watch as Yanni got her “no” and Yanni had to watch as Nick got his “yes”. She seemed happy for him but who knows what one ticket will do to them? As for the last audition of the night, that was “Hollywood” Anderson and learn the name because he is going to be someone one day. Hollywood was a homeless young man and then last year someone had taken a chance on him and given him a guitar. Now, that same guitar and Hollywood’s own voice has secured him a ticket to the actual Hollywood. And that’s what American Idol is all about. It was created to give people like Hollywood a chance and it was good to see that in action tonight!